According to a study in the American Journal of Clinical Nutrition, women who walked at least four hours a week were 44% more likely to lose weight during the 15 years the study lasted than those who barely walked, regardless of what other exercise they did. The general recommendation is to walk at least 45 minutes most days of the week to lose weight. In addition, it is important to maintain a healthy and balanced diet in order to lose weight. Walking is a low-impact exercise that is gentle on your joints. Walking not only burns calories to lose weight, but it also improves muscle tone, strengthens bones, and reduces stress. Walking outside is the best to get some fresh air and sunshine to improve mood and increase energy. Walking for 45 minutes can burn around 240 calories on average. It is important to switch up speeds and even types of walking to burn more calories and see results. Beneficial walking techniques that you can do for a few minutes include toe walking and squat walk. These are fairly self-explanatory, and are beneficial because they engage different muscles than regular walking does. When first starting out, remember to stretch and take it slow. Simple ways to incorporate more walking into your daily routine are swapping one short car trip or bus ride with walking or getting off one or two stops early and walking the rest of the way. Just remember to give yourself enough time to get where you need to go. The ideal balanced diet includes all of the food groups: protein, fruits and vegetables, dairy, and grains. Healthy eating habits to lose weight are important. While watching your calorie intake can be beneficial, it is more helpful to eat healthy foods overall and exercise than to meticulously count calories. It has been shown to be more beneficial to eat three healthy meals a day, as well as small snacks every three to four hours for maximum energy. Healthy foods to incorporate into your diet include salmon, eggs, whole grain pasta and bread, spinach, avocados, asparagus, oranges, and mushrooms. There are three elements of yoga: physical poses (called asanas), controlled breathing (practiced in combination with asanas), and short periods of deep relaxation and meditation. Yoga is a gentle exercise, and classes vary from beginner level to challenging and advanced. Studies have shown that yoga helps losing weight, and can reduce the impact of stress, anxiety, and depression. It also improves flexibility, balance, and muscle tone. Swimming is an excellent low-impact exercise that can help relieve menopause symptoms. It is great for relieving joint pain, as moving in the water means no pressure is put on the joints. It is also an effective calorie-burner and improves overall health and fitness. This low-impact exercise is easy on the joints and allows you to get some fresh air and vitamin D. There are typically well-maintained bike paths in parks nowadays that make it easy for cyclers to stay safe from traffic. 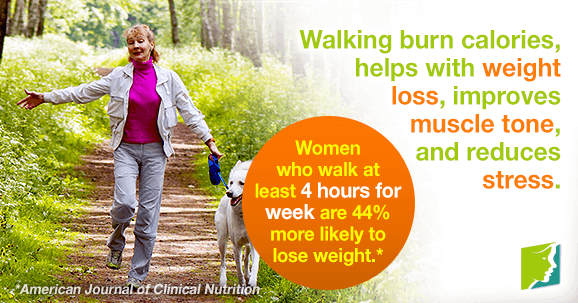 Walking offers countless health benefits and can help you lose weight. Studies have shown that exercising can increase energy levels as much as 20%. Low-impact exercises - like walking and cycling - are also gentle on your joints. Remember to stretch before walking and build up to longer distances. Read more about treatments for weight gain during menopause. Many women experience weight gain and changes in distribution of weight throughout menopause. Click here for tips on managing weight in a healthy way.